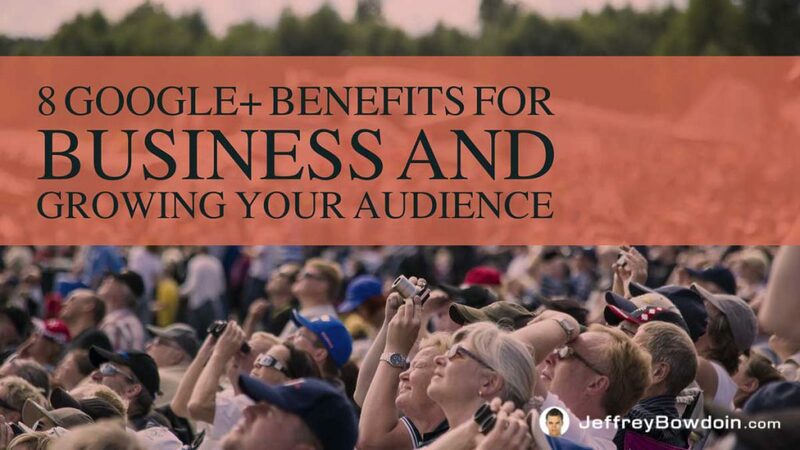 There are many great benefits to using Google Plus as a business. I don’t see a lot of business owners running out to create a Google Plus page. Failing to actively use Google+ is a missed opportunity for your business. The following are 8 Google Plus benefits for your blog, website or business. If used right Google+ can be a fantastic marketing tool to grow your audience, get your content and name out there, and foster relationships with your audience. To reach your audience, you want to occupy the spaces where they hang out. The thing is, everyone has a different preference on their favorite social media network. Some people spend most of their time on Facebook, while others spend more time on Google Plus or Instagram. To maximize the growth of your website traffic, you should occupy the spaces where your audience hangs out. You shouldn’t put all your eggs in one (social media) basket. You should be engaging with all the major social media networks that are relevant to your target audience. Google Plus is likely to be one of those. The social media networks with the highest number of active users are Facebook, Instagram, Twitter, and Google+. If you only have time to operate a handful of social media accounts, you should be active in the four largest social networks (at a minimum). To maximize your impact, you should be using Facebook, Instagram, Twitter and Google Plus. These are the four heavy hitters in the social media world. This is just a general rule of course, as you may choose to use other social networks based on your target market. For example, you may want to substitute Pinterest for another social network if your target market is mostly female. Google+ is not as big as Facebook or other social media sites regarding active user bases. However, that doesn’t mean you shouldn’t be on Google Plus. The lower user base can be a competitive advantage. Since there is smaller user base than say Facebook, it is naturally less competitive! Think about it; Facebook is the 800-pound gorilla in the social media world. Most marketers, business owners and people in your niche are likely already marketing heavily on Facebook. Even though Facebook has a larger user base, the engagement and the ability to reach, customers may be much lower. This is due to the competition from competitors in your niche, fighting for the same audience’s attention. If you want to dominate your niche on social media, Google Plus may be the way to go. It is likely easier to become the go-to expert for any given niche on Google+ than it would be on say Facebook. It could even be argued that you should focus more of your efforts on Google Plus than any other social media network. Google Plus can help you achieve your Search engine optimization goals. I recommend that people post their blog posts on Google+ right away. Better yet, you can use IFTTT and WordPress to automate this process completely. Google Plus is great for SEO because every time you share your blog posts on Google Plus, it helps Google index your content faster. The way the search engine spiders index new content is through links. What better way to encourage Google spiders to crawl your new content, then by posting your recently published blog post on Google’s social network. A big part of SEO is getting backlinks (links to your blog from other sites). The safest way to do this is first creating great content, then marketing your content in hopes of securing a link. Google Plus is an excellent way to network with other like-minded people and get your content out in the world. The more discoverable your content is, the higher chance you will get a link. Goolge+ and Google My Business are vital for SEO if you are targeting a local market. There are some correlations between local rankings and Google my business usage that make the use of Google+ obvious to local marketers. If someone plus 1’s your blog post, your other content is more likely to show up in Google search results for that person. Google uses its Google +1’s to personalize user’s search results. In effect, this encourages more repeat visitors to your site if they plus 1 your content. I believe that creating a Google Plus account can build trust and credibility with people and the search engines. The same thing goes for being active on other social media accounts as well. After all, real businesses are typically active on social media. If you have a blog or brand that is active on social media, it might establish credibility as a reliable business (rather than a spammer). It may only be one small trust factor (out of many), but it is one you should capitalize on. If you haven’t heard of Buffer, you should look into this great software. Buffer is a social media marketing automation tool. It allows you to schedule posts for different times and different days for each social media network. Buffer is similar to HootSuite. However, you have a lot more flexibility with the number of posts and when to post each network. Though you shouldn’t completely automate your social media marketing, tools like Buffer and HootSuite can help you be much more efficient in your marketing. Currently, Buffer is only compatible with Google plus pages. If you wanted to schedule out posts for your personal Google Plus profile, it would not allow you to do that. This is another significant benefit to creating a Google Plus page for your blog, website or business. Many people don’t think they have the time or resources to manage 4+ social media accounts as mentioned above. This is especially the perception of many blog owners who operate as a one man show. However, with the availability of great automation tools like IFTTT and Buffer, you have no excuse not to. You should use as many social media sites as possible. They all help in marketing your content.